Out of that family disaster, Kopit (who wrote books for the hit musicals Phantom, Nine and High Society as well as the memorably crazed Ah Dad, Poor Dad, Mamma’s Hung you in the Closet and I’m Feelin’ So Sad) wrote Wings. Fusing brilliant imaginative speculation with humour, in Natalie Abrahami’s revival it becomes a deeply moving, ultimately even uplifting account of what it might feel like for a stroke victim, trapped inside a disfunctioning brain, unable to name things properly. Hardly the most appealing of subjects, reading the script, I have to confess, is even more terrifying. Kopit’s research, his analysis and stage directions set up an even stricter, more intense framework of confusion, disorientation and entrapment. 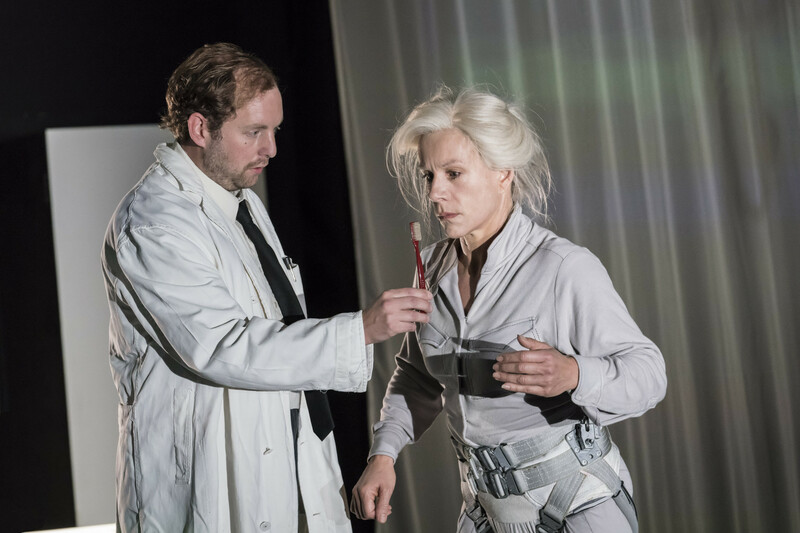 Abrahami hasn’t entirely managed to overcome this plethora of indications but my goodness, with Juliet Stevenson she has created something so beautiful, balletic and cosmic in scope I was constantly reminded of Stanley Kubrick’s 2001 – A Space Odyssey. Together, Abrahami and Stevenson – I take it Stevenson had a hand in conceiving this concept – have hit upon the flying motif endemic in the subject Kopit took for the basis of his stroke-victim character, Mrs Stilson. Kopit had met a veteran aviatrix in the rehabilitation home he had visited after his father’s stroke. 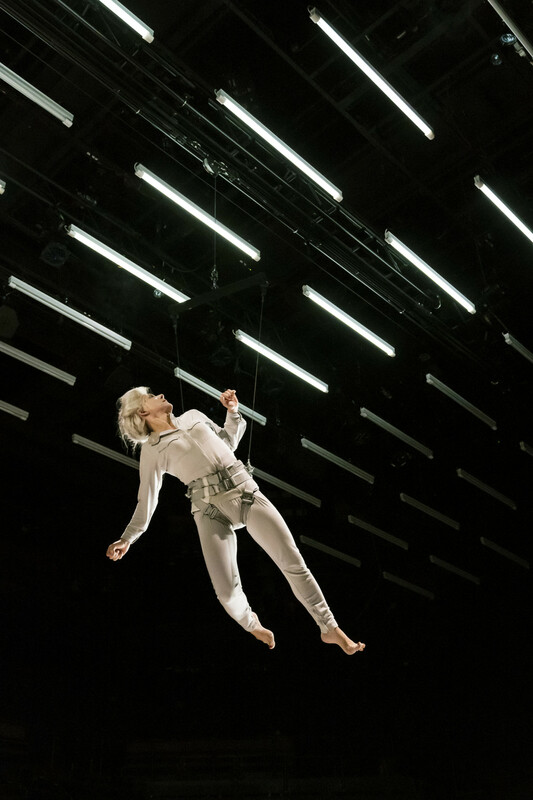 Her experience of flying becomes, especially in this production, the over-arching dramatic metaphor for the sense of collapse and neurological disfunction that overcomes Mrs Stilson after her stroke as Stevenson, encased in a flying harness, delivers the garbled speech and attempts to reunite her damaged internal and external worlds. Stevenson’s physical movements are a marvel. Performing acrobatic whirls, then walking on tiptoe, she sometimes seems to glide, sometimes crawl like a baby. That harness becomes at once another form of prison but also a liberator as she soars, beginning to piece together disjointed memories, remembering – just – the feeling of being in the air, looking down, before – neurologically – crash landing. Sadly, it’s true, the other characters in this nightmare become – as they may be for Mrs Stilson – peripheral. She/Stevenson is the main focus – and the doctors and nurses, coming and going in her consciousness mere phantoms, appearing behind gauzes and on moving platforms. It is a slightly cumbersome affair and in the Young Vic, we are all too close to the mechanics. But despite these drawbacks, for this viewer, such is the power of the image, the situation and above all Stevenson’s fearless brilliance, both the terror and the sheer liberating force of Mrs Stilson gradually beginning to make sense of her predicament became almost unbearably poignant and touching. At one point, a nurse comes forward to give Mrs Stilson a bunch of flowers brought in by a friend. Stevenson, on the tips of her toes like a child, hovering just above ground gazes down with a kind of rapture before exploding, sending the flowers crashing. The frustrations of loss of speech – aphasia – the cacophony of sensations within her and the distress of uncontrolled emotion burst out in one violent gesture. An unforgettable moment, disintegration and speech confusion never make for easy viewing. Many years ago, Joe Chaikin, the mover and founder of New York’s experimental Open Theatre suffered a major stroke leaving him with aphasia. I can still dimly remember his appearance in London and the play written around him – as indeed even just last year, Peggy Shaw of Split Britches fame, similarly integrated her stroke into her latest piece, Ruff, with extraordinary and powerful effect. Abrahami’s Wings, however, remains exceptional, even with the technological problems it has apparently undergone which have severely delayed some performances. Stevenson has ridden it all, with aplomb. 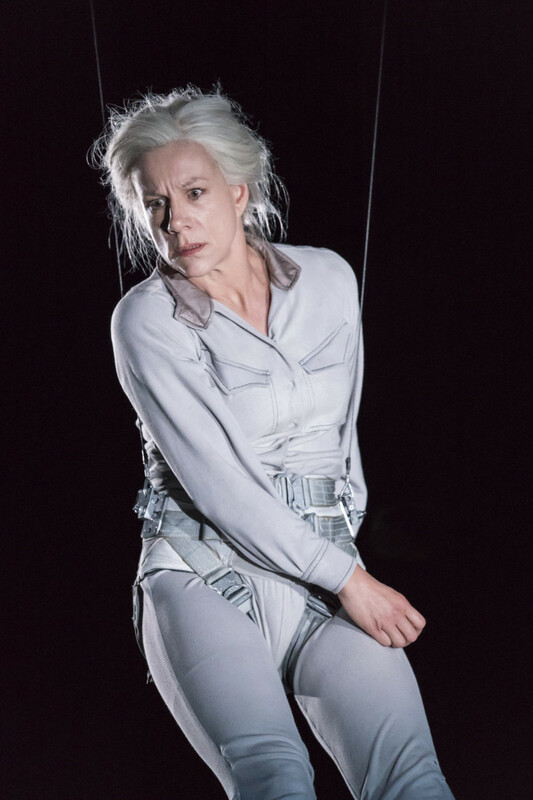 What a professional and what an amazingly brave performer whose life is in the hands of the selfless cast whose role is often just as walk-ons – commensurate with Mrs Stilson’s hazy experience of them – but who, each performance, as they strap her into her harness, must get it right! Praise, too, must go to Lorna Brown, who plays Mrs Stilson’s therapist, Amy. 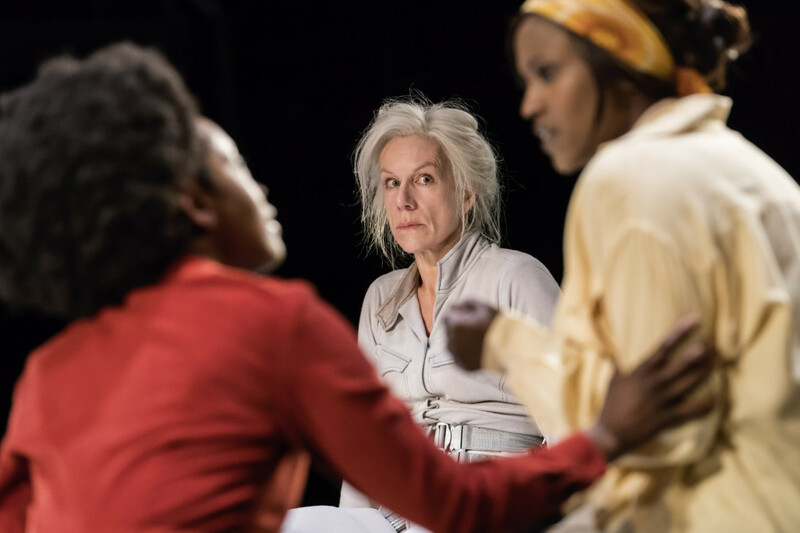 Brown played crucially, and with enormous understatement, the nurse to another stroke-victim character in Vivienne Franzmann’s Bodies (Royal Court), earlier this year. She’s an actor of rare, calm, quiet attention. But it is to Kopit I finally salute. An act of true love and dangerous risk to enter into such a frightening state of being, one we might all dread. At the end, as Mrs Stilson remembers one of her flying journeys, she beams with joy, even as she might again be entering into the final oblivion. But this time, it is without fear. First presented at the Yale Repertory Theatre, New Haven, Connecticut, March 3, 1978.